Devastator Tank Mobile Platform is our newest robot track platform, it is fully compatible with most popular controllers in the market such as Arduino, Raspberry Pi and so on. 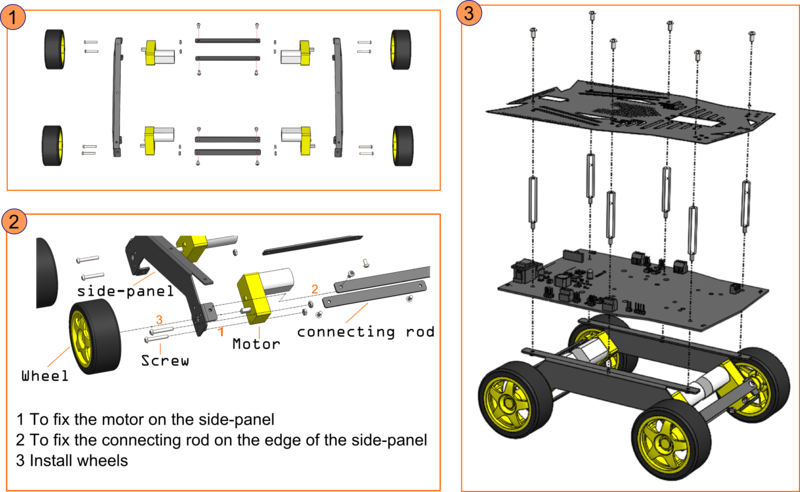 Users are able to add various sensors, servos, turntables and controllers (e.g. Romeo All-in-one, Raspberry Pi Model B ) with multiple mounting holes on the Devastator platform. It is perfect for hobbyists, educational, competitions and research projects. Step 1: Locate two side rails and four crossbars (all black metal), 4 yellow motors, and the bags containing long bolts, washers and lock washers, and medium short machine screws. Step 2: Line up a motor with the hole in the angled section of a side rail. The white plastic shaft should protrude through the flat side of the rail. Step 3: Pass two long bolts through the holes in the angled part of the rail, and through the holes in the yellow plastic motor case. Step 4: Place a flat washer, then a lock washer, then a bolt on each of the two long screws. Tighten. Step 5: Repeat Steps #2-4 three more times. All four motors should be in all four sections of angled rail. All long bolts, washers, lock washers and nuts should be used. Step 6: Line up a crossbar with two holes of the side-rail. (Note that the diagram above only shows one hole in the crossbars, but there are actually two.) You should be able to see the yellow plastic of the motors through the holes. Screw that cross-bar to the rail with two medium-short machine screws. Step 7: Repeat Step #6 seven more times, until the four crossbars connect the two side rails. All crossbars will be used. You will have medium-short machine screws left over. Step 9: Repeat Step #8 three more times. All wheels should be on all motors. NOTE: Make sure the Tank is connected to the Arduino GND when using USB to power the microcontroller. Get Devastator Tank Mobile Platform (SKU:ROB0114) from DFRobot Store or DFRobot Distributor.